This is what I've got! 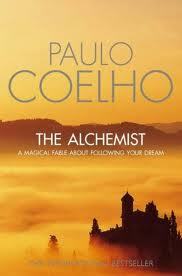 A book echoing with the voices of dreams, destiny and optimism, ‘The Alchemist’ by Paulo Coelho is a book that urges people to pursue their destinies, the cause for which they were sent into this world by “the one hand which created everything”. The book tells the tale of a boy Santiago who chose to be a shepherd in order to fulfill his dream of traveling. When he decides to go, his father's only advice is "Travel the world until you see that our castle is the greatest and our women the most beautiful". In his journey, Santiago sees the greatness of the world, and meets all kinds of exciting people like kings and alchemists. However, by the end of the novel, he discovers that "the treasure lies where your heart belongs", and that the treasure was the journey itself, the discoveries he made, and the wisdom he acquired. As the alchemist himself says when he appears to Santiago in the form of an old king "when you really want something to happen, the whole universe conspires so that your wish comes true". This is the core of the novel's philosophy and a motif that echoes throughout the book. The author suggests that those who have the courage to listen to their heart and follow the path it shows indeed end up being a part of “The Soul of the World”. The others are doomed to a life of misery, emptiness and unfulfillment. ‘The Alchemist’ is a novel that may appeal to everybody, because we can all see ourselves in Santiago: all of us have dreams, and are dying for some inspiration to realize them. The novel skillfully combines words of wisdom, philosophy, and simplicity of meaning and language, which makes it particularly readable and accounts for its bestselling status. All I would say is just read it till the end and you’ll finish it with a smile on you face. The whole essence and excitement of the book lies in the very last page! Posted by Malavika Varma. Powered by Blogger.